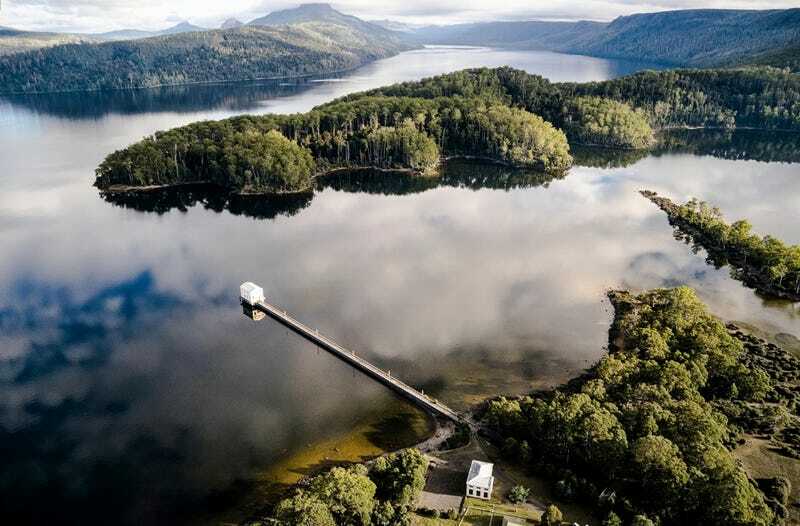 In 1995, the hydroelectric power plant on the shores of this Tasmanian lake went dark for the final time. It’s remained silent for 20 years since—until this year, when it re-opened with a radically different business model: A hotel. It turns out that hydroelectric power has a long legacy in Tasmania—back in the 1930s, the government invested heavily in building the infrastructure to supply power using a series of dams, reservoirs, and hydroelectric power stations, like the one that used to sit inside these two buildings on Lake St. Clair, a protected wilderness area in the heart of Tasmania. The building at the end of a 800-foot-dock once housed the turbines, while a house on the shore was used to run it. After the enormous turbines inside the pump house went silent in 1995, the former hydroelectric plant was abandoned—its Art Deco splendor rotting away alongside the lake. After a developer was granted the right to redevelop the two decaying, heritage-protected buildings a few years ago, the job of renovating the spaces fell to Cumulus Studio, a Tasmanian architecture firm. The interiors were restored and eventually turned into modern hotel rooms, complete with bathrooms, fireplaces, and other amenities. Today, it’s a resort called Pumphouse Point, and for a few hundred bucks a night, you can sleep at the end of the dock, too.